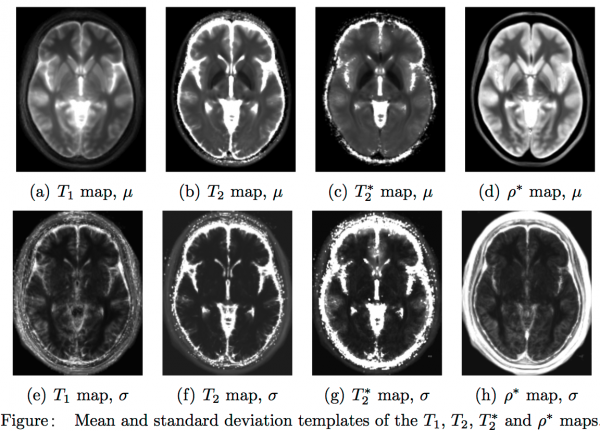 This package contains statistical templates of relaxometry maps for the human brain at 3T. These maps were computed based on T1, T2 and T2* relaxometry maps using images acquired on a Siemens Verio 3T scanner. The templates are built from a population of 20 normal controls (7 male, 13 female, mean age=32.0+-15.1 y.o.). It is available as a single zip file download here. The file size is approximately 360 Mb and contains a readme file describing all available images. Further information can be found in http://vip.creatis.insa-lyon.fr/.